Paddington 50p Coin 2018 Release Date | Mintage | What's it worth? Released in 2018, the Paddington 50p is a 2-coin set. Paddington Bear At The Palace 50p. Uncirculated. Straight Out Of Minted Bag. 2018 SCARCE 50p Fifty Pence Paddington Bear Coin Cover PNC Ltd Edition of 1,000! Paddington™ at Buckingham Palace 2018 UK 50p Brilliant Uncirculated Coin. Part of a 2 coin set, still available from The Royal Mint as a BU coin in a presentation package. Paddington™ at the Station 2018 UK 50p Brilliant Uncirculated Coin, still available from The Royal Mint as a BU coin in a presentation package. Paddington 50p coins were released by The Royal Mint in 2018 to celebrate the 60th Anniversary of Paddington’s first adventures in the famous book. Where to buy Paddington Bear coins? Whilst you may be lucky enough to find Paddington 50 pence coins in your pocket change, chances are they are showing signs of being next to other coins in cash drawers or people's pockets. Coin collectors can purchase Brilliant Uncirculated (BU) coins, that have not been in general circulation. What's the Paddington 50p worth? Paddington Bear 50 pence coin is available from The Royal Mint in BU (Brilliant Uncirculated), Silver Proof and Gold coin versions. Paddington Bear coin collectors can start with the Brilliant Uncirculated (BU) version of the Paddington at the Station 50 pence. Paddington is sitting on his trusty suitcase at a station with what looks like an Intercity 125 train picture behind him. The DK is the initials of the Reverse Designer, David Knapton. The JC on the Queen's Head side, is the initials of the Obverse Designer, Jody Clark. • Britain’s best-loved bear – new adventures on a UK coin! Presented in a colourful folder (see image below), this coin has been released Celebrate Paddington and relive his stories all over again. The Silver Proof version of the Paddington Bear at the Station 50 pence, is presented in a clear acrylic case. This will be familiar to collectors of the wildishly popular Beatrix Potter 50p silver proof series, featuring Peter Rabbit and friends. Beautiful colour printing brings this silver coin to life with the familiar red hat and blue coat of Paddington waiting for a train. The Beatrix Potter series were a limited mintage of 30,000 per coin in the series, the Royal Mint has elected to make the Paddington Bears coins available in a Limited Edition Presentation of 60,000. This means that more people will have the chance to secure Paddington coins, but on the flip side means it is half as rare as the Beatrix Potter coins. We think Paddington coins will be popular but it remains to be seen if he causes the same frenzy of buying and high prices on eBay after-sales as we saw with the 2016 Peter Rabbit coin. 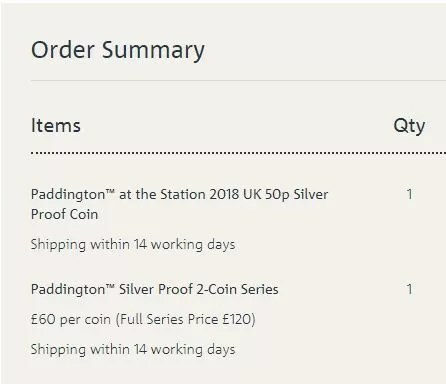 The Mintage figures for the Silver Proof version of the Paddington 50p were confirmed by The Royal Mint on the 25th June 2018. The Royal Mint announced that only 75,000 coins will ever be available of this Paddington 50p design. The Paddington Gold Proof 2-Coin Series is now completely sold out at The Royal Mint. The issue price was £780 per coin (Full Series Price £1,560). This 2-Coin Series consists of 2 Limited Edition coins struck in 22-carat gold. Paddington™ at the Station 2018 UK 50p Gold Proof Coin and Paddington™ at Buckingham Palace 2018 UK 50p Gold Proof Coin. Paddington 50p Gold Proof Coins were released as a limited set of just 600 coins to be minted in each design. The Royal Mint also state it is alloy 22 Carat Gold with a weight of 15.50g and a diameter of 27.30mm. The Reverse Designer is David Knapton and the Obverse Designer is Jody Clark. These coins will be Quality Proof minted in Year 2018 from Pure Metal Type Gold. Where is Paddington Bear from? The fictional bear from "Darkest Peru" has been featured in over 20 books written by British author Michael Bond. Paddington is dressed in an old red hat and blue duffle coat complete with a paper tag asking you to "Please look after this bear - thank you". He sits on a battered old suitcase which has a secret compartment - allowing it to hold many more things than it would appear to! Paddington has a real love for marmalade! The Paddington Bear 50 pence coins are being released as a set of 2 coins. The first on the 18th June 2018 and entitled, "Paddington at the Station". When you order this coin in Silver of Gold Proof edition, you have the option to buy the Silver Proof 2-coin series or Gold Proof 2-coin series when you place your initial order. Above is a screen capture of our order for the silver set, the top shows the station coin, with a "2-coin series" add-on item below. This means you are pre-ordering the 2nd coin to be released in August from The Royal Mint and they will hold the authority to debit your payment card when it it ready for dispatch. This is a great way to secure both coins in the set, without having to remember to order the coin when it becomes available. Presumably it means you are also sure of getting the coin ahead of new single coin orders. Please check The Royal Mint website for Paddington 50 pence coin availability and prices before bidding on eBay, as some coins may still be available directly at their release prices. The Paddington 50p is a 2 coin series with the Paddington bear 50p pre order available for the 2nd coin in August 2018. Released to celebrate the Paddington bear 60th anniversary, these Royal Mint new coins include new coloured 50p versions of this new 50p coin for the Silver Proof mints. Royal Mint 50p 2018 releases continue to delight UK coin collectors around the world.